White nationalist, white supremacist, Western civilization - how did that language become offensive? Steven Arnold King (May 28, 1949 –) is a member of the United States House of Representatives from Iowa's 4th congressional district. Some of them are valedictorians — and their parents brought them in. It wasn't their fault. It's true in some cases, but they aren't all valedictorians. They weren't all brought in by their parents. For everyone who's a valedictorian, there's another 100 out there who weigh 130 pounds — and they’ve got calves the size of cantaloupes because they're hauling 75 pounds of marijuana across the desert. [Global warming] is not proven, it's not science. It's more of a religion than a science...Everything that might result from a warmer planet is always bad in [environmentalists'] analysis...There will be more photosynthesis going on if the Earth gets warmer...And if sea levels go up 4 or 6 inches, I don't know if we'd know that...We don't know where sea level is even, let alone be able to say that it's going to come up an inch globally because some polar ice caps might melt because there's CO2 suspended in the atmosphere. I had a strong, Christian lawyer tell me yesterday that, under this decision that he has read, what it brings about is: It only requires one human being in this relationship -- that you could marry your lawnmower with this decision. I think he's right. If we continue down this path, I assure you it will not take long for our country to crumble. Illegal immigrants utterly disregard our Rule of Law and way of life here in America. They already break our laws by coming illegally so what will stop them from continuing to do so? It's not about Harriet Tubman, it's about keeping the picture on the $20. Y'know? Why would you want to change that? I am a conservative, I like to keep what we have. Here's what's really happening: This is liberal activism on the part of the president that's trying to identify people by categories, and he's divided us on the lines of groups. ... This is a divisive proposal on the part of the president, and mine's unifying. It says just don't change anything. King: This ‘old, white people’ business does get a little tired, Charlie [Pierce]. I’d ask you to go back through history and figure out where are these contributions that have been made by these other categories of people that you’re talking about. Where did any other subgroup of people contribute more to civilization? Chris Hayes: Than white people? King: Than Western civilization itself. It’s rooted in western Europe, eastern Europe and the United States of America and every place where the footprint of Christianity settled the world. That’s all of Western civilization. But you know, you know that statistically the greatest danger to a black man in America is another black man. We can’t restore our civilization with somebody else’s babies. I'd like to see an America that is just so homogeneous that we look a lot the same. Every American should take note of those candidates who stand with the economic interests of America’s citizens, and who stand with the Rule of Law, by rejecting Amnesty in all its forms. It is wrong when Democrats seek to demean the intrinsic value of American citizenship by importing the Third World to replace the millions of voters their redistributionist policies and racial grievance politics have driven away. It is also wrong when Republican leadership conveniently chooses to waive the application of the law to guarantee a supply of unskilled and low-cost workers for their corporate benefactors. Without the right to life, how would an individual’s rights become vested? How could any other rights be realized if one’s very life could be taken away by another who is exercising their right to liberty or pursuit of happiness? Jefferson articulated a prioritized set of rights; first the right to life, then the right to liberty, then the pursuit of happiness. Each right was carefully prioritized in sequential order because the right to life trumps all other rights. No one can take a human life in exercising their liberties and no one can take a life or take away the liberty of another in their pursuit of happiness. If the right to life can be taken by another, then no right of anyone is protected. White nationalist, white supremacist, Western civilization – how did that language become offensive? The rationale is that if infidels are eating this pork, they aren't eating it, so as long as they're preparing this pork for infidels, it helps send 'em to hell and it'll make Allah happy. I don't want people doing my pork that won't eat it. Let alone hope I'll go to hell for eating pork chops. Gabriel, Trip (January 15, 2019). "A Timeline of Steve King’s Racist Remarks and Divisive Actions". The New York Times. 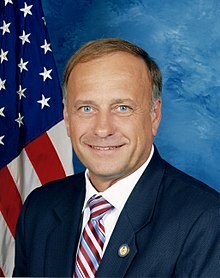 "Steve King Quote of the Day: 100 Days of Quotes from (and about) Iowa's 4th District Congressman". This page was last edited on 5 February 2019, at 22:07.